A new framework of high-selective plasmonic-induced reflectance (PIR) in a plasmonic-induced transparency (PIT) system is presented by using planar dielectric-metal-dielectric (DMD) metamaterial nano-structure. We used glass as substrate, the first dielectric, gold as metal thin film, and prism as the second dielectric. The proposed plasmonic nano-structure has been investigated based on finite difference time domain (FDTD) method. Results show that by coupling incident light with dark and bright plasmonic modes, without losing the metamaterial structure symmetry, the transparent window is created at 1550 nm and can be tuned. The transmittance (T), reflectance (R), and absorbance (A) coefficients of the presented nano-structure can be considerably varied by changing the thickness of thin films and dimension of the strips. The reflectance coefficients of dip1 (200 THz) and dip2 (265.5 THz) are almost near zero, and the transmittance coefficient of PIR (227.1 THz) is 0.93. Also, the maximum sensitivity and figure of merit are 664 and 3.77 for reflectance dip2, respectively. Similarly, the maximum quality factor (Q) is 10.74 for reflectance dip1. 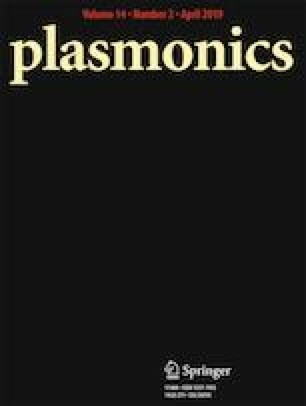 The presented plasmonic metamaterial nano-structure with mentioned unique features is a good candidate for several applications such as multi-channel plasmonic filters, bio and refractive index sensors, optical antenna, and slow-light devices for using in optical nano-electronic circuits and systems.